Scholarship is an award of financial aid for a student to further education. Scholarships are awarded on various criteria usually reflecting the values and purposes of the donor or founder of the award. There are 100% facility to provide Scholarship every year to all student of all catogery.The new detail of 2010 year scholarship. From year 2013, the nature of this competition has been changed. 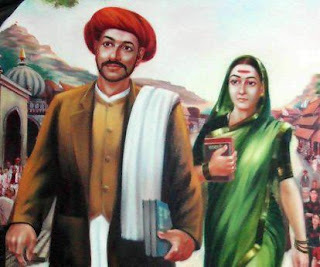 We have decided to take an objective question type exam based on the Marathi book “Tejaswini” written by Prof. Gautam Nikam which has brief narratives on life struggles and messages of the great women leaders of India. Along with this exam an essay writing competition will also be conducted supportively to choose best 9 girl student. Every successful girl student from first 9 awarded Scholarship of Rs. 2000/- and all participants got KRANTIJYOTI SCHOLARSHIP CERTIFICATE. Who is Eligible to apply Maharashtra Post-Matric Scholarship at mahaeschol.maharashtra.gov.in? Students who have passed SSC from Maharashtra State Board in March 2013 and October 2012 will be able to register when SSC data is available. Maharashtra RSMS online applications now on mahaeschol.maharashtra.gov.in website apply now by registering your details in online. Who is Eligible to Apply Maharashtra RSMS online applications? Maharashtra RSMS Scholarship For 11th and 12th class students, Students who have passed SSC from Maharashtra State Board in March 2013 and October 2012 will be able to register when SSC data is available. Savitribai Phule Scholarship For 5th to 10th standard students, For SC/SBC/VJNT students (Girls only). Thanks for these information. It’s very useful article for students. I am sure many students would like to receive a scholarship. And now they’ll know how to fill out and submit an scholarship application Thanks to the author. Oh my goodness!!! Thnks buddy for the valuable info. Your post help lots of people. Thank you for sharing! I'm looking for this.